This organic fertilizer blend provides a hearty balance of slow-release nutrients without posing the risk of burn. 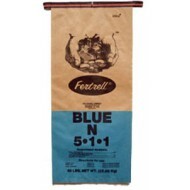 Additionally, it improves water pen..
Fertrell Blue N 5-1-1 Organic Fertilizer, 50 lb. This advanced formula provides time-released nitrogen in a multi-nutrient organic fertilizer. 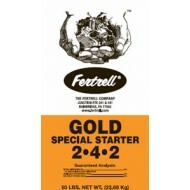 Blue N is specially formulated for crops that require mo..
Fertrell Gold Starter Special 2-4-2, 50 lb. Gold Starter Special 2-4-2: The readily-available phosphorous in this starter or "pop-up" fertilizer speeds germination and promotes fast, vigorous gr..
Cottonseed Meal is a great nitrogen source. 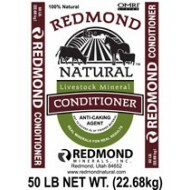 This all natural fertilizer's low pH level makes it an excellent, slow-release source of nitrogen fo..